September 16, 2006 is the last day New Yorkers can view highlights from the late Richard Avedon's amazing photograph collection. 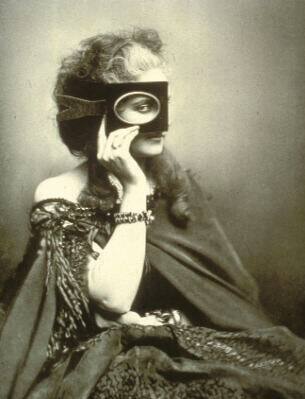 The oldest and most significant photos on display are those by Pierre-Louis Pierson of the Countess de Castiglione. Avedon had what was considered by many to be the most important collection of her portraits in private hands. Indeed, the small photographs on display were once owned by Christian Bérard, who mounted the photographs into a black album and then surrounded them by his own drawings and writings. Beyond their beauty, these portraits provide the fashion historian with a clear example of how the skirts in the early 1860s were beginning to form a teardrop imprint, foreshadowing the bustle periods of later decades.